I'm solitary and I study different things about magick whenever I become curious. I've studied the basic basics. I've read a little on spirit guides and animals, divination (a few types), contacting spirits (a few methods), runes, and some other things. I have a little experience in weather magick and luck spells. I'm pretty good at reading into people- as in what kind of person they are and what goes on in their head- some might call it intuition. I'm not too familiar with herbs or most types of spell 'additions' (like incense and oil use etc.). Im not a very consistant witch- more of a dabbler who will stop practicing when life becomes hectic and comes back when I need it. That is probably why I have yet to find an individual path for myself. 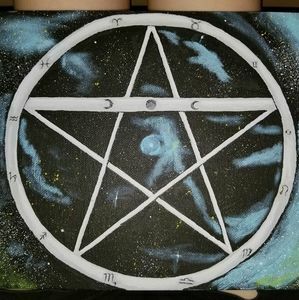 I am currently working on expanding my experience in crystal/stone use in magick, divination by tarot, and making clay charms. I have wanted to astral project for some time, but since I am a bit out of practice I will have to move that down on my to do list. I am going to college for nursing, and therefore I may not be on as often as I would like to.